Notice and agenda filed in the office of the City Clerk and posted at City Hall at 5:00 p.m. on Friday, August 17, 2012. A. Approval of August # 1 Payroll in the amount of $43,826.96. B. Approval of Claims in the amount of $79,252.34. C. Approval of Minutes from July 31, 2012 Special Meeting and August 6, 2012 Regular Meeting. D. Approval of Cemetery Deeds: Kenneth Pollard-2 spaces. E. Approval of Budget Amendments: Police-Public Auction Proceeds $1,902.95; Police-Public Auction Proceeds $2,245. ; Police-Wal-Mart Donations $1,021. 7. Discussion and possible action to approve Ordinance Number 863, an Ordinance accepting, adding and annexing to the City of Collinsville, Tulsa County, Oklahoma, all that certain real estate being more particularly described hereinafter; providing that said real estate shall be part of the City of Collinsville, Oklahoma, and all persons residing therein, if any, and all property situated therein, shall be subject to the jurisdiction, control, laws and ordinances of the City of Collinsville, Oklahoma; directing notification, and declaring and emergency. (located West of South 12th Street on the North side of East 140th Street North). -- Approved, 2 lots owned by Donnie Hutchison are being cleaned up and he hopes to build houses on them. They were adjacent to the city limis but not in until this change. 9. Report from Mary Risley with Collinsville Downtown Inc. -- Mary reported on recent Ardmore training session focused on food / restrauants / cash mobs / farmers markets. ... etc. 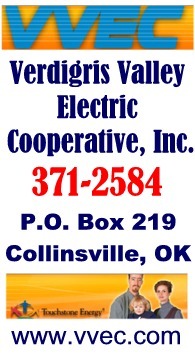 She also reported briefly on the up-coming (Sept. 20th) Taste of Collinsville. Teachers will receive $5 off the family tickets by showing a current school issued ID. 10. Discussion and possible action concerning the disposition of surplus bricks. -- Approved saving (& protecting) the bricks removed from 3-4 blocks of Main Street during the S-Curve/widening project. Commissioner Brad Francis wants the bricks used to repair (& possible expand) the existing brick streets before any bricks are declared surplus. 11. Discussion and possible action concerning termination of Retail Attractions, LLC contract. -- Approved the termination of the (recently approved) contract with Rickey Hayes' Retail Attractions for economic development. It was stated that the city hopes to use the funds instead for a person focused specifically on Collinsville, rather than the Hayes group which represents many cities. * Land & Water grant approved for $123K (which city must match) for 2 new pavilions, additional parking, and landscaping at city park. * Reyna Serna ... new city employee at utility payment window. * Mayor Weaver working with Congressman Sullivan for potential veterans grant to help with Veterans Building roof replacement. A. Approval of August # 1 Payroll in the amount of $27,478.53. B. Approval of Claims in the amount of $401,816.58. C. Approval of Minutes August 8, 2012 Regular Meeting. D. Approval of Budget Amendments: State Building Fees Collected June 2012 $136.00; State Building Codes Fees Collected July 2012 $136.00; Administration-Reimbursement for APPA Conference $2,419.38.